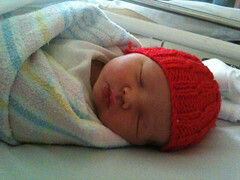 ... born at 11.15am on Wednesday 9 February, 2011, weighing 3.6 kgs, displaying a healthy vocal ability and already looking as cute as his sister. And so the Robinson/Nogrady family expands to a happy foursome with the arrival of Pascal. So far, he has proven a champion eater, sleeper and pooper, as most newborns do, but already seems to be showing signs of being a fairly calm little character. Nina is being a gorgeous big sister, bestowing lots of gentle little kisses on Pascal's sleeping head, and is adjusting really well to having a little baby in the house. Lots more pics and video to come!